I take this seriously and have offered confirmation classes every year. In the communities I’ve served, I always have found families in which parents are interested in their children learning more about the faith, taking the vows for themselves, and receiving baptism if they never have. Now I have been asked to share about the program I use, because this ministry has contributed to higher-than-average numbers in professions of faith by both youths and adults in those churches. My own profession of faith was made in morning worship at Boston Avenue UMC in Tulsa following my childhood confirmation class. I remember taking the classes on Sunday afternoons when I was in the sixth grade. I learned about the Christian faith, and my class jointly developed an affirmation of faith. We used that creed in worship on the Sunday we were confirmed. Today as a pastor, I have moved the classes to the Sunday school period. I emphasize the importance of regular worship; a student or family is less likely to skip worship if classes are held during Sunday school. Inviting the students to serve as worship liturgists or help the pastor during Holy Communion also helps them grow in their faith. I utilize 12 class sessions. We begin in January, when families often are ready to make new commitments. For 12 weeks, they attend both Sunday school and worship together. For people outside the church, new to the faith, 12 weeks is just long enough to be a significant commitment — and not too long to scare them away. 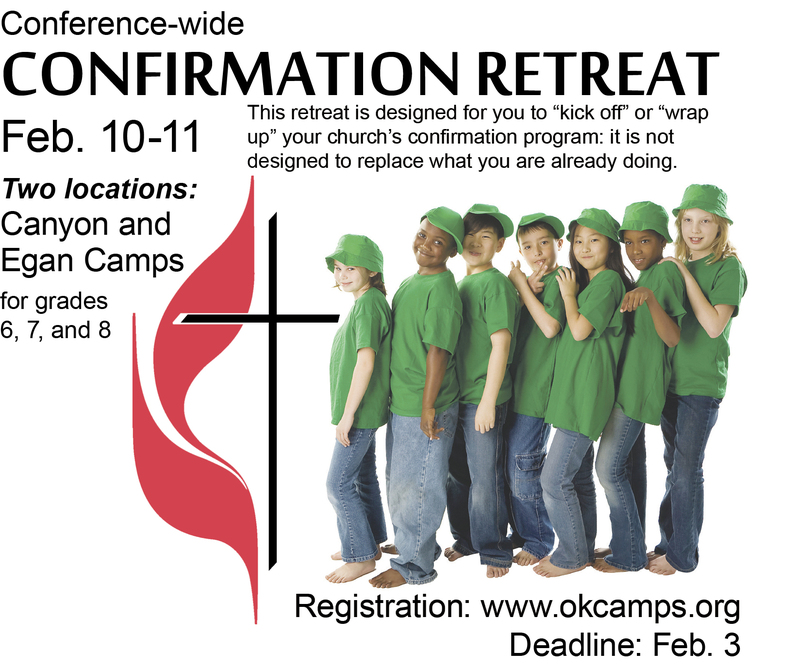 At Edmond-First UMC, we offer concurrent adult confirmation classes. An associate pastor presents the same material to parents or other interested adults, also during Sunday school. If the adults went through confirmation, that likely was years ago, so our classes help bring faith renewal for the whole family. Also, we often find at least a few parents who are not members of our church — and some have never made a profession of faith or been baptized. During our worship service that concludes the confirmation experience, parents are invited to renew their vows along with their children. Some also will join the church, profess their faith, and be baptized at that time. Some new adult Sunday school classes have formed after those 12 weeks together. We also invite other adults to act as mentors to our young confirmands. They share notes of encouragement, greet them in worship, and help out on occasion with youth fellowship events. This is helpful in faith formation for more of our adults, as well as growing our youths’ comfort level and connections within our congregation. During the 12 weeks, we take field trips. We make visits to humanitarian agencies related to the Church. On Confirmation Sunday, we take an afternoon hike at Canyon Camp, introducing this United Methodist facility to the confirmands. We hope to return with them for summer church camps. We sometimes invite other youths — who have completed confirmation — to help our confirmands feel comfortable in the youth group, a natural next step for them. We track all families who visit throughout the year and contact those with confirmation-age children. We check with member families that we haven’t seen for a while that have children the appropriate age. We make our best attempt to invite all of these through letters, emails, and calls. There are even more ways to extend invitations. Perhaps a Scout troop meets in your church. If middle schools in your community publish class directories, send letters to all those parents. Use social media, where you can market your event for little or no cost. Ask students who already enrolled if they will invite friends who don’t attend church — or if you may invite those friends on their behalf. Be aware that in every school district, adults who experienced confirmation in their childhood have fallen away from regular church attendance. Sometimes your letter or contact about the upcoming classes will serve as God’s prevenient grace, nudging them back to the community of faith, too. Confirmation Sunday is my favorite worship service of the year. As an ordained elder who has vowed to instruct the children, what a joy it is to share our faith with others at this critical juncture in their lives! Although I made plenty of poor choices in my middle- and high-school years, I know my faith kept me on the right path during that time. I knew what was expected of me as a faithful Christian. Sharing this faith with young people who are beginning middle school is life-giving. It renews my own faith as well as the church. Whether you are a pastor or lay member reading this, I encourage you to begin planning a confirmation class for your church. It is never too late to start!